February’s retail sales results reflected the significant Wall Street and international economic turbulence that started off the year. The weaker than anticipated retail sales figure revealed generally greater caution among consumers for the month, but this modest pullback could ease in the coming months. Questions surrounding the strength of the U.S. consumer will undoubtedly arise, but the sound state of the labor market, moderate wage growth and lower gas prices provide a meaningful tailwind for the retail industry. Should a new flare-up of volatility in international markets emerge, U.S. consumer activity could face renewed challenges. After posting a moderate growth rate in February and a downward revision in the prior month, core retail sales advanced 4.3 percent over the past year, slightly ahead of the long-term average. Store-based spending, which excludes autos, gasoline, restaurants, and internet sales, rose last month and is up 3.4 percent year over year. Within the store-based segment, receipts at grocery stores rose nominally over the past 12 months as some business migrates toward multiline retailers including Target and Wal-Mart. 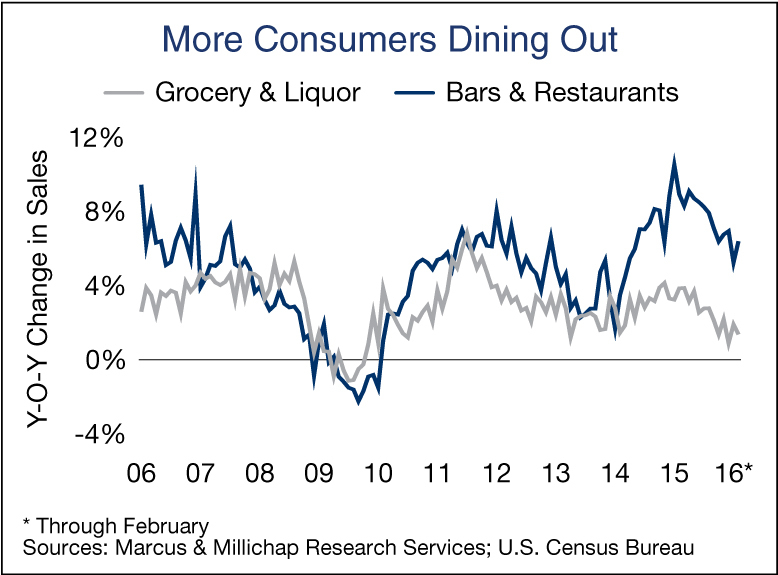 Grocery stores are also feeling the effects of changing lifestyles that favor dining out; sales at bars and restaurants climbed 6.4 percent over the past year. Despite a minor downtick last month, nonstore retail sales, dominated by e-commerce, climbed 6.4 percent from one year ago. The digital sphere remains on-track to become a dominant marketplace and vital distribution channel for both traditional retailers and online merchants. Category leader Amazon recently unveiled plans to lease 20 Boeing jets to supplement its logistics capability, enabling a higher level of customer service. The firm also announced plans to open several brick and mortar locations, representing a pivot in strategy. Growth in nonstore sales appears to be eating into department store results, with category receipts down 2.1 percent since February 2015. Home-improvement projects supported a 12.1 percent rise in sales at building-materials stores and garden centers over the past year, the greatest of any retail category, as sales of single-family homes continued to find its footing. Building-materials sales typically increase as home sales rise, but also when homeowners look upon their residences as an investment whose value can be enhanced. Furniture and appliance stores also posted modest growth during the past 12 months. Shopping at traditional outlets continues to bring additional traffic to shopping centers and intensify efforts by retailers to find new locations. The opening of new stores will trim U.S. retail property vacancy 30 basis points this year to 5.9 percent and support rent growth in the high-2 percent range. Construction remains restrained and heavily concentrated in single-tenant formats. Some vacancies will occur in the coming months, however, as Men’s Wearhouse and Sports Authority close locations. This entry was written by marcusmillichap, posted on March 22, 2016 at 11:23 pm, filed under Uncategorized. Bookmark the permalink. Follow any comments here with the RSS feed for this post. Post a comment or leave a trackback: Trackback URL.